Welcome to issue 167. Since last month's issue there have been a lot of rumours and speculation about the new adaptation of Good Omens floating about on the Internet. At the time of writing, nothing has officially been confirmed - but we hope that this will change soon. Terry Jones recently mentioned in his blog http://terryjones.tumblr.com/ that he thought that it would be made into a feature film [Good Omens, not his blog ... Ed]. I think I'm safe in saying that it definitely won't be a feature film adaptation. Last month we unashamedly borrowed a quote from Douglas Adams' Hitch Hikers Guide to the Galaxy in our readers' letters section. Right near the bit where we ask you to give proper credit if you used somebody else's works. We completely failed to follow our own advice by embarrassingly forgetting to credit the wonderful Mr Adams. Sorry. As of issue 166 last month we are now producing a version of Discworld Monthly that is formatted for the Kindle. We looked at the various distribution options but all of them involve the Kindle owner paying for the content so we have instead set up a new section of our website where we will publish the Kindle files. We may look at introducing a RSS feed to let you know when the new version is available. Discworld fans will have not one, but two new Discworld Games to enjoy in 2011. 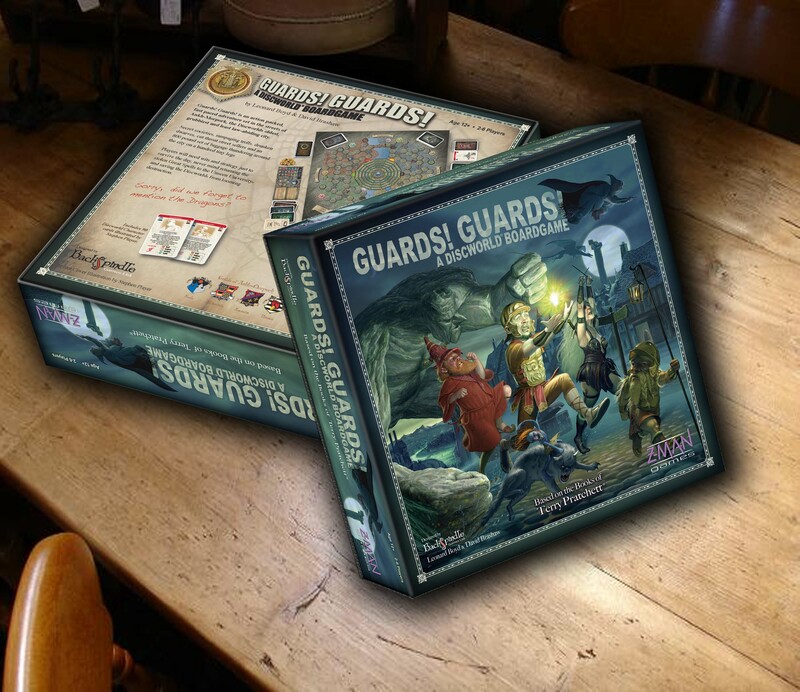 We mentioned the Ankh-Morpork game last month, the other is called Guards! Guards! A Discworld Boardgame and is well on its way to hitting the shelves this summer. Stephen Player has recently been commissioned to produce the Illustrations for the game. The game will be in the shops in June/July 2011. It will be published by Z-Man Games in the US and will be distributed by Esdevium Games in the UK & Europe. The game sees players taking on the role of newly recruited members of the Ankh-Morpork City Watch. With the Eight Great Spells missing from the Unseen University the future of the city hangs in the balance. Each player is tasked to collect and return a number of the spells to the University before the news of their loss gets out and chaos ensues. "Well, from what Terry's said about it, it sounds as if SNUFF will be stageable, which will make it our November show at the Unicorn. In the meantime, we're staging GK Chesterton's The Man Who Was Thursday on 11-14 May. I thought that, as Terry's a fan, and Neil G's a fan, there might be a few interested folk out there in the Pratchett multiverse...? Terry did rather well at the recent SFX awards (SFX is an excellent sci-fi magazine published in the UK) winning awards for best novel for I Shall Wear Midnight and the SFX Outstanding Contribution Award. SFX's website includes Terry's acceptance video. The Alzheimer's Research Trust (of which Terry is a patron) has recently changed its name to Alzheimer's Research UK. Alzheimer's Research UK is the UK's leading dementia research charity. It funds world-class pioneering scientists to find preventions, treatments and a cure for dementia. The objective of the re-brand was to create a new visual identity that helps 'uplift recognition' amongst the charity's target audiences, encourage greater support and, ultimately, accelerate its charitable progress. Do you know what Amigurumi is? No neither did I - apparently it is the Japanese art of knitting or crocheting small stuffed animals and anthropomorphic creatures. [UK, New] SUDS - Sheffield University Drama Society will be presenting Wyrd Sisters at the University Drama Studio, Glossop Road, Sheffield from Wednesday 2 - Saturday 5 March 2011. 9 GBP full price 7 GBP for students and other concessions. Monday 7th March 2011 - The new Perth branch of the Drummers Downunder, cousin to the Broken Drummers, will be having their first meeting from 7pm at The Vic Hotel, 226 Hay St, Subiaco, Australia. Monday 7th Match 2011 - The Drummers Downunder (Sydney) meet at Maloneys on the corner of Pitt and Goulburn Streets (across the road from World Square), Sydney, Australia at 7pm. Monday 7th March 2011 - The Broken Drummers meet at The Monkey Puzzle, Paddington, London, W2 1JQ, England at 7pm. Visitors to any of the events will be made welcome. [AU] The third Australian Discworld Convention will be held on 8th, 9th and 10th April 2011 at the Penrith Panthers conference centre in Penrith, NSW. Places ARE limited so register now! Terry has confirmed he is coming and more special guests are to be announced soon. Keep checking in at http://ausdwcon.org/ The website has been updated with hotel information, Guilds and lots more. [DE] The Liber troupe will bring McBest [Wyrd Sisters - Ed] on stage in Weilheim/Bavaria on 15/16/17 April. [NL] The first Dutch Discworld Convention takes place at Hotel NH Atlanta in Rotterdam on 28th - 29th May 2011. Program items so far are Premiere for the Netherlands of Going Postal, a Banquet buffet, a Masquerade and Workshops. No news about Guests of Honour yet. [US] NADWCon2011 planning is underway. The dates of the new con will be July 8-11, 2011, and the location will be the Madison Concourse Hotel and Governor's Club, in Madison, Wisconsin. [UK, New] Following on from last year's great success with Wyrd Sisters, Collingwood RSC will be performing Jingo at The NEW THEATRE ROYAL, Portsmouth, Hampshire, England. The dates you want to know are Tuesday 12 till Friday 15 July 2011. curtain at 1930. FOUR shows ONLY. Box Office number 02392 649000. Ticket prices Stall and Dress Circle 12 GBP (concession 10 GBP), Upper Circle 8 GBP (concession 6 GBP). Registration has started and about 80 tickets remain. You can let people know that you will be there by visiting us on Facebook. Dennis Pelson writes: Discworld fans in the US might like to take a look at Look Out Mountain Book Store, a company that specialises in Terry Pratchett books. We assume any correspondence is eligible for use in the newsletter unless otherwise stated, including the sender's email address. We may also edit your letters and remember to give proper credit to Douglas Adams when appropriate. You compared the pile up of Christmas post with the Ankh-Morpork post office in Going Postal. I work in tax so have a lot of correspondence with Her Majesty's Revenue and Customs (HMRC) whose backlog of post and their ability to lose correspondence has become legendary. Having lost all this post (I am certain there are rooms stacked to the ceiling with it) I have to write further letters appealing against assessments and penalties because 'I have failed to submit a tax return' and this fuels the fire even more. Alas! In these enlightened days HMRC have removed their telephone contact numbers from their website and the ones we know are almost permanently engaged. The email inbox has, I suspect, dozens of virtual rooms filled with unopened emails. I look forward to reading Snuff and watching Unseen Academicals. I am sure that I am not the only one who can spend a happy hour or so 'casting' actors to play my favourite Discworld characters. For a long time I thought that Julian Rhind-Tutt would make a splendid Carrot, Maggie Smith as Esmeralda Weatherwax and of course the late Pete Postlethwaite as Vimes. Any other suggestions from readers? Don't let's leave it up to the TV people, they get it wrong. My least favourite of theirs was David Jason as Rincewind. David is a brilliant actor but he was far too old for the part. * From: "Cynthia M Games"
Picking up on the comments about the Discworld year naming system, I am impressed by the real world 2011 Chinese New Year of the White Metal Rabbit. I am reeling with visions of an albino Ozzy Osbunny, or the famous Rabbit sculpture by Geoff Koons, which I have always considered quite cute (it's a rabbit balloon hollowcast in steel I think), but as years go, the name alone sounds quite fun! In November 2010 I turned 80, and had a pleasant series of mini celebrations, including a magnificent bunch of flowers at Hogswatch in Wincanton, which I managed to keep alive for almost a month (thanks, Bernard and Isobel!). And a couple of weeks later my colleagues at the Folklore Society produced a totally delicious iced cake, with Discly decorations, namely the Librarian, three inches high, in tawny sugar, seated on a pile of books and with other books scattered at his feet. These had tiny photos of the dust wrappers of my own books embedded in their surfaces. I haven't had the heart to eat my words, let alone to eat the Librarian, so the whole lot is now kept behind glass in one of my bookcases. In the still of the night, a muffled but apparently contented ook is sometimes heard. Does this [a cat full of sixpences] have something to do with a cat eating a lot of pudding? I haven't been able to figure it out. It was used in I Shall Wear Midnight. "Tiffany had wondered how Granny and Mrs Proust would get on, given that both of them were as proud as a cat full of sixpences." "Tiffany stood outside herself and watched herself twirl the beautiful dress as black as a cat full of sixpences, and she thought: I shall wear midnight, and I will be good at it ..."
Looks like Daily Mail correspondent Liz Jones may be a Pratchett fan - her one-eyed cat with no tail is called Grebo. I work as a reporter. I covered a Skype conversation today between a few local high school students and an Egyptian student in Cairo. The audio was a little fuzzy. When they talked of Tahrir Square, I thought they were saying "Sator Square." I couldn't figure out why Sator Square sounded so familiar. Was it the site of another pro-democracy movement? Was it in Prague? London? I went to Google. The first page of hits were about some ancient Roman palindrome. Then I got further down and saw the references to Discworld. Ah! Of course. It's in Ankh-Morpork, and it's where free speech is allowed and encouraged. How appropriate. I love how Discworld is always turning up in my daily life. * From: "David & Dayle Youngs"
We watch the quiz show Jeopardy most nights. Last week, after demonstrating that a computer that is allowed to look up the answers can beat two mere human beans, the final question on the Teen show was to complete the title I Shall Wear ___, and they were given the addition clues of Terry Pratchett and Tiffany Aching. None of them even attempted to answer it. On a visit to St Petersburg with school over the February half term, we were told by our guide about the Gostinyi dvor (a kind of indoor market) on Nevsky Prospekt, which used to, so we heard, have a part of the building set aside for thieves and allied trades to sell their goods, on the theory that it would encourage them to regulate themselves. I immediately thought of the Guild of Thieves, Housebreakers and Allied Trades in Ankh-Morpork, and wondered whether Pterry had known of this when creating an official thieves' guild. Seen in Glasgow, are these possibly the "Nac Mac Feegles" or a Glaswegian fan club? They do seem to fit the definition: The Nac Mac Feegle, known also as the Wee Free Men, appearing in the works of Terry Pratchett. Their skin appears blue, since they are heavily tattooed and covered in woad, and all have red hair. The tattoos indicate which clan the Feegle belongs to. They talk in a heavy Scottish accent (usually Glaswegian, in the clans so far encountered). They are notably strong and resilient, which comes in handy given that male Feegles (which means almost all of them) tend to be notoriously rowdy. I just started getting DWM, and thought I would share with you the Mutant Vehicle my husband and I created to use at Burning Man last year. We will be upgrading it for the coming year. We are planning on extending the shell and rebuilding the elephants. Since WorldCon is in Reno, Nevada the week before Burning Man (which is in the desert a couple of hours out of Reno), the vehicle is scheduled to be exhibited there. I saw this picture [of a man in the Egyptian revolution] in the paper and thought, surely he can't be using normal bread to protect his head ... it must be dwarf bread. In this series of articles I will look at the various Discworld games (either computer or physical) that have been developed over the years. I'll kick the series off with the original computer game The Colour of Magic based on the book of the same name. The Colour of Magic is a semi-graphical adventure that was released for the ZX Spectrum, Commodore 64 and the Amstrad CPC. Most of the time the screen is text based and occasionally you get into an area that has a picture of the scene. It is reminiscent of the classic adventure game version of The Hobbit. The game was developed by Delta 4 and was published by Piranha Games. The game follows the plot of the book very closely and much of the text is taken straight out of the book. In fact the first piece of flavour text you get to read is the explanation of directions on the disc. This is vital in fact because the navigation of the game shuns the normal North, East, South and West directions for Rimward, Hubward, Widdershins and Turnwise. You play the role of Rincewind in the game and so start the game nursing a small mug of beer in The Broken Drum just as Blind Hugh, Twoflower and The Luggage arrive. Like many games of the period you are left to work out what is required by yourself with little or no explanation of even which commands are possible ... expect to be regularly told that whatever you want to do is not possible. The Spectrum version has a custom font that looks more fantasy based but the standard font of the Commodore 64 version is much easier to read. Thus proving I still remembered those programming skills from my youth. Unfortunately I couldn't remember how stop it and closed down my browser instead. Games have moved on a long, long way since 1986 and so I can only recommend talking a look at The Colour of Magic for nostalgic reasons. 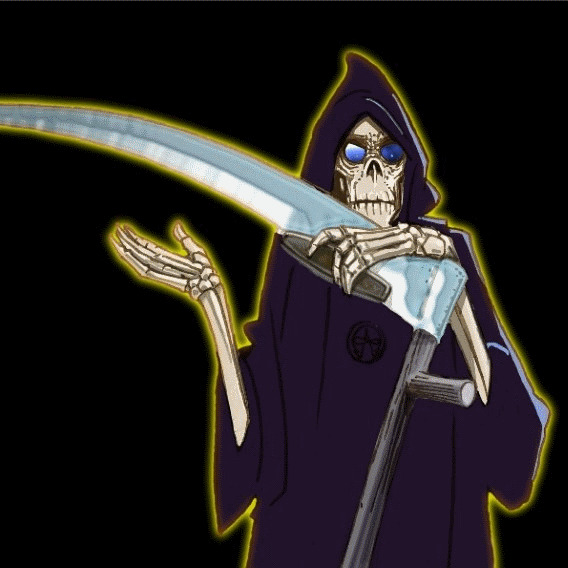 Next time I'll look at Discworld by Psygnosis and how to run it in ScummVM on modern hardware and Windows 7. Last month while I was tidying up my study I found a signed US first edition copy of I Shall Wear Midnight in a jiffy bag which the publisher sent to me to give away. Due to a misunderstanding, it appears we're now obligated to give away the book itself, not the jiffy bag. In which issue of Discworld Monthly did we first review I Shall Wear Midnight? The answer we were looking for and for the most part received was Issue 160 - August 2010. Bizarrely just over 160 people got the correct answer. The randomly selected winner and soon to be owner of the signed US first edition I Shall Wear Midnight is Stephen Dunn of Cramlington in the North East of England ... unless you'd really prefer the jiffy bag, Stephen. Copyright © 2011 Discworld Monthly.